Evenflo has recalled over 202,000 Embrace 35 rear-facing infant carriers, which were manufactured between Dec. 2011 and May 2013. See the affected model numbers at Evenflo's site. 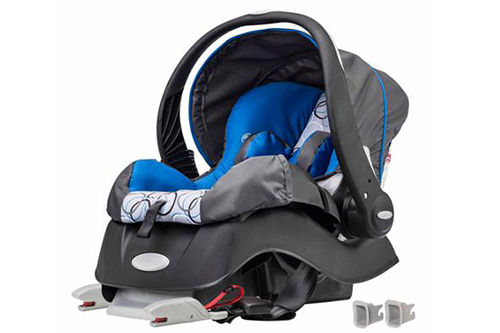 The carriers are still safe, crash-wise, but the buckles and harnesses become sticky and hard to open when covered with food and stuff, and that slowness can pose a safety hazard. So they're sending out replacement harness kits, which you install yourself. Also, think about cleaning the car seat once in a while; it's disgusting. If you're in an accident, no one really cares if you're wearing fresh underwear, but investigators are going to see all the encrusted goo and crumbs and cheerios and crap all over and under the kid's car seat.